Watching the two brothers in “The Motel Life”, I was reminded of the close relationship between the father and son characters in Cormac McCarthy’s novel “The Road”. In a grey, apocalyptic world nearly devoid of hope and humanity, father and son cannot possibly imagine living without each other, and that makes the story all the more poignant as they desperately hold onto each other in front of more despairing plights on their uncertain journey across barren landscapes. While their lives are less gloomy in comparison, life is still tough for Frank (Emile Hirsch) and his older brother Jerry Lee (Stephen Dorff), who have wandered together for many years in Reno, Nevada. Their father, who was probably not a very good dad to them, left his family when they were young, and, as instructed by their dying mother, two young brothers had to take care of themselves. After she died, they attempted to leave town together to avoid getting separated by the authorities, but, unfortunately, Jerry Lee lost his right foot when they tried to get a free ride on a freight train. Since that terrible accident, they have been stuck in the shabby world of low-rent motels and seedy bars, and they look lonely and isolated with no visible future for either of them. While Jerry Lee currently has a girlfriend, it is apparent that their relationship will not last that long just like his previous relationships with other women. Frank is still haunted by the memories of his ex-girlfriend Annie (Dakota Fanning) as he slowly descends into the pit of alcoholism. One dark, cold winter night Jerry Lee accidentally runs over a little boy with his car. It is a hit and run, and Jerry Lee is afraid of going to jail. Trembling with panic and guilt, he tells Frank that they must leave Reno immediately, and they soon get out of the city by their old car. However, things do not go well for them, and they find themselves in an even more difficult circumstances when Jerry Lee burns their car to get rid of it, then is brought to a local hospital after his botched suicide attempt. The police come to the hospital to question Jerry Lee and it is apparent they smell something suspicious about him. Jerry Lee is terrified of getting arrested. He says he would never make it in prison, and pleads with Frank to sneak him out of the hospital. While Jerry Lee becomes ever more remorseful about his deed, Frank, desperately tries to find any possible way to get the money to buy a car to get them out of town. While there is tension as Jerry Lee and Frank try to wiggle out of their troubles, the movie wisely puts more emphasis on characters, leisurely moving along its simple plot, and we meet a few people around these two sad, unhappy brothers. Their friends, Tommy (Joshua Leonard) and Al (Noah Harpster), come across as losers as pathetic as them, and Jerry Lee’s girlfriend Polly (Jenica Bergere) seems no better. Earl Hurley, a used car dealer played by Kris Kristofferson, is more sympathetic. He once hired Frank not long after Jerry Lee’s train accident. And while he looks genuinely concerned when he learns of Frank’s sudden decision to leave the city, he does not ask too much about Frank's and Jerry Lee's future plans. There just doesn't seem to be a lot of hope. The movie uses animation to provide a glimpse into how Frank and Jerry Lee find comfort and solace in their own private world through their imaginations. Frank concocts short stories for them and Jerry Lee draws various sketches inspired by his younger brother’s tales. These stories and sketches morph into animation. While some of the stories are adventure tales with Frank and Jerry Lee as brave heroes, other stories are about women and wild romance, and because they grew up around casinos and strip clubs, these elements also find their way into their stories. In some instances these animation sequences feel more like filler material, but they work because they are reflective of Frank and Jerry Lee’s seedy life environment as well as their wishes and hopes. The animation by Matt Smith is nicely drawn in its gray-brown tone. Some of its most potent imagery includes pulpy elements such as a loony pirate captain with very nasty traits or a sensual hospital nurse ready to inject another drug into her patient. The movie is based on Willy Vlautin’s acclaimed debut novel, which was adapted by Micah Fitzerman-Blue and Noah Harpster. While their adapted screenplay is terse and sparse, its unforced narrative provides enough space for mood and characterization, and the directors Alan and Gabe Polsky, who made a directorial debut with this film (after producing several films including Werner Herzog’s “Bad Lieutenant: Port of Call New Orleans” (2009), show considerable skill and confidence in their competent direction. The weary loneliness surrounding their main characters is palpably felt along with the bleak wintry background. The Polsky brothers and their cinematographer Roman Vas’yanov give us a number of well-handled scenes which are restrained but effectively capture the somber undercurrent of deep sorrow and desperation below the surface. One of the main scenes is a long-take shot unfolding in a local casino building, and this stylish approach uses fluid, unobtrusive camerawork, and effectively sets the ground for the following scene. The Polsky brothers draw very good performances from their actors. Completely different from his recent lightweight turn in David Gordon Green’s quirky comedy film “Prince Avalanche” (2013), Emile Hirsch shows an unexpected side that surprise us in this film. His harrowing performance conveys the quiet despair and torment bubbling inside his depressed character. As Frank is fueled more by his growing self-loathing along with lots of alcohol, his deteriorating body eventually gives him a painful warning. Hirsch does not hit any false notes as his character Frank struggles to start another depressing day with his usual groggy hangover. When Frank meets his ex-girlfriend later in the story, we see a small glimmer of hope between them. Annie looks better than before as a girl making a new start, and it is possible that she and Frank will restart their relationship, although their past looms as a dark cloud hovering over them. Dakota Fanning is solid in her supporting performance. She and Hirsch have a sad, tentative scene where their characters try to be a little closer to each other during their own private time. As two people scarred by their harsh world, they are drawn to each other as before, but we also see how they are inhibited by themselves. 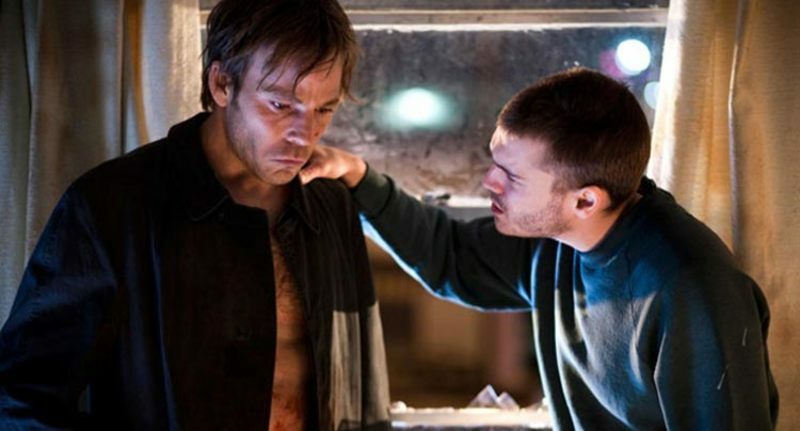 As a wretched man who has no one to depend on except his younger brother, Stephen Dorff is heartbreaking to watch in one of the best performances of his career. He and Hirsch click together well with the real sense of brotherhood between their characters, and they are particularly good during the scene where Jerry Lee takes a shower with Frank’s assistance in their motel bathroom. Dorff bares his character’s nakedness and vulnerability while Hirsch supports him physically and emotionally. Their earnest performances make this scene one of the warmest and most intimate moments in the film. “The Motel Life” has a wounded but sincere heart fueled by its praise-worthy performances, and we come to see its damaged characters as basically good people despite their flaws and mistakes. At one point, Earl gives wise advice to Frank: “Don’t make decisions thinking you’re a low life. Make decisions thinking you’re a great man.” It may come quite late for Frank and Jerry Lee, but, as reflected by the final scene of the film, it is never too late to follow that advice. Next Article: Thirtieth Anniversary of "A View to a Kill" Previous Article: "Goodbye Solo"